I had not given a thought to what a difference it can make when you treat another person with simple respect and dignity, the same respect and dignity you want for yourself. That is so simple, yet so few seem able to do it. Day of Tears is a fictionalized account of the weeping time – the largest slave auction in American history, known by this name because it was accompanied by heavy rain. To pay for his gambling debts, Pierce Butler, owner of the Butler Plantation, auctioned off 436 of his slaves. Julius Lester’s novel includes Butler, his abolitionist ex-wife and their two daughters as characters, but the story mostly focuses on those who were sold away from their loved ones, as well as on those who were left behind. 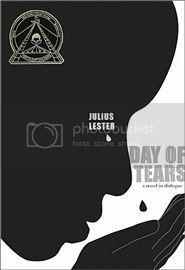 Day of Tears is subtitled a novel in dialogue: the story is told exclusively through the character’s voices. Most of it is dialogue, except for a few sections which would be more accurately described as longer monologues. If this sounds strange to you, don’t worry. The whole thing flows really well, and it reads very much like a story told by multiple narrators. The use of multiple points of view is actually one of the novel’s greatest strengths. We get to hear the voices of all the characters, and as a result every one of them is portrayed as fully human – even Pierce Butler, even his daughter Frances who grew up to write books defending slavery. As repulsive as their thoughts can be, we see them as people. I know I keep returning to this point, but I truly think that this is an important thing to remember: even the most horrific acts in history were committed by real human beings. Not by monsters, not by beasts. As you might have noticed by now, I have a fondness for books that remind us of this. A lot of what happens in Day of Tears is painful, but there’s a lot of hope too. The novel is extremely balanced: it doesn’t try to use slavery as the backdrop for an inspirational story of survival, but it’s not completely bleak either. It acknowledges that there was cruelty and kindness; there were victories and losses. What makes it work so well is the fact that it was written with such obvious respect – respect for history, and for the people who lived through it. History is not only an accounting of what happened when and where. It includes also the emotional biographies of those on whom history imposed itself with a cruelty that we can only dimly imagine. This book is another in my attempts to make real those who did not have the opportunities to tell their stories for themselves. Reading your description of this novel, I was really intrigued by the concept of a novel written entirely in dialogue. I'm not sure I've ever encountered such a thing! This book also sounds a lot like Toni Morrison's "A Mercy", which I read earlier this year and really loved. If you haven't read that one, then I highly suggest it. It's good! I hadn't even finished reading your review before I rushed to add this to my wishlist. I love books that show as you say that all of these acts are committed by other people, and I think it's always so interesting t see the cruelties and the humanity. I think that's why I loved Kindred so much. Oh how I love that passage you shared from the Author's Note! "Emotional biographies"...what a brilliant way to put it. And I so agree...I think fictional accounts add so much to our understanding of the humanness of real-world events. Not that non-fictional accounts aren't vitally important, of course, but they can't always capture the totally of experience. This book will definitely be going on my wish list. Thanks, Nymeth! It sounds wonderful! I think I'd like this type of writing style...and with Becky backing you up on this one, I really think I'd like it. It reminds me a little bit of City of Refuge, only a totally different topic and totally different time period :p A fictional tale that accurately describes a real event..I guess that would be historical fiction, huh? duh...And I love the title of this one! Emotion is the key. It is amazing how many novels DON'T have the emotion...I read a WWII novel not long ago that totally lacked the emotion. That is just wrong! I also love this cover - simple but beautiful. This sounds like such a powerful and emotional novel. I really want to read it after your review. This does sound like a powerful read. Great quote by the author at the end of your review! A book completely in dialogue. Very intriguing. I have read very little about slavery. I enjoyed Pirates by Celia Rees and Beloved dealt with slavery, though more as a back story. I wonder if I would be able to read this without getting emotional. This seems like it would be really difficult to read through, emotionally. I get super-invested in characters when they're written well. Your review is beautifully written! This sounds unique -- I've never read a story entirely in dialogue before. This is going on my TBR list. Excellent review Nymeth. This is a powerful book and with this being written like he did made it that much more powerful. Lester has a way with words and emotions. I recommend this book often to my older readers who are looking for a gripping story that will stay with them for some time. And yet another book added to my wish list. :) I love that you say the book was written with respect; too often books such as this can be preachy and focus more on telling viewers how they should feel, rather than telling a story. This does sound worth reading. And I agree with Steph, Toni Morrison's A Mercy is a must, if you haven't read it. I also liked (ages ago, pre-blog)Andre Brinks' A Chain of Voices, linked monologues with a similar theme, but in South Africa. You would find that interesting, i think. Thanks for the review--Day of Tears is on the list. The quote you included towards the end of your post is meaningful. I will keep this book in view. Thanks, Ana! This sounds like a very powerful book. I completely agree with you and the author about history being more than just facts. I think that's why it's so fascinating to me- people think it's static, but I have always thought it was such a fluid and changing subject, depending on who was telling the story. I'll put this one on the wishlist. Thanks! On a shallower note, the cover art is really good. Steph: I don't think I'd encountered anything like it before either! But the monologue bits worked as narration, so in the end it wasn't very different from other novels with multiple first-person narrators. I have not read A Mercy yet, but I love Morrison and definitely plan to. Nicole: This reminds me that I need to add Kindred to my pile of books I plan to read soon! Becky: It really is. Now I need to read Cupid! Debi: I think you'll really love it! Chris: lol :P Not all historical fiction does it well, though, and not all of it is as grounded on specific real events. So I can definitely see why you thought of City of Refuge. Sandy: I remember your review of that one - a book without emotion really doesn't work. Naida: Isn't it great? He summed up what I loved about historical fiction so well. Vivienne: I confess that I cried, but maybe because the book is for younger readers, it's not as bleak as, say, Beloved. It doesn't sugar-coat anything either, but you know what I mean. Lena: As I was just telling Vivienne, even though Lester doesn't sugar-coat anything, there's a hopeful ending. But it's still difficult at times, of course. Stephanie, I hope you enjoy it! I was uncertain about the structure, but the result wasn't as unusual as I thought it'd be! Staci: He really does. I need to read more of his books! Trisha: Very true! But he avoided that pitfall completely. ds: I must get my hands on A Mercy! A Chain of Voices I hadn't heard of, but it also sounds amazing. Alice: He summed it up so well. Aarti: I completely agree. As the saying goes, history is told by the winners. I love the fact that fiction tried to recapture those lost voices. And I completely agree about the cover! Wow, it sounds so powerful and yet not hit-me-over-the-head with emotion. I must find it. It sounds like an unusually formatted book, but also like a very interesting one. I haven't read much about the slave trade, other than incidental mentions in books on other subjects. I might try to change that with this book. It sounds like it has both an interesting and touching story as well as a unique style. Great review, I am glad you liked it. I love reading books like this! So emotional and thought-provoking. It'll definitely goes to my wishlist. Thanks for your wonderful review, Nymeth! This sounds like a powerful book, both because of the story, and the way it is told. Rebecca: Yes - it was very moving without ever becoming sentimental! Zibilee: For some reason I keep returning to books that tend to upset me, like ones about slavery and WWII. I guess it's because extreme situations act a bit like magnifying glasses for everything people are capable of - both the good and the bad. I hope this makes sense! Melody: I think you'd like this one a lot. J.T. Oldfield: The structure worked VERY well! This book sounds amazing, painful, and emotional all wrapped together. I agree with you that it's important to remember that what happened happened to people--whether they were slaves, slave owners, abolitionist, etc. And I love that it's written in all of the different perspectives. I'm also going to tell my friend Laura (who has sadly stopped blogging) about this one--she is really interested in reading books about slavery and the Civil War south and I think she'd really like this, too. Thanks so much for bringing this book to my attention. I added it to my TBR.